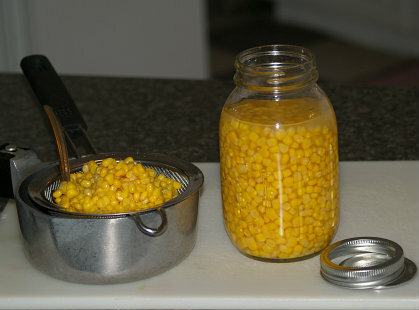 For canning corn, like all canning foods such as peppers and pickles, it should be freshly gathered and canned as soon as possible. The kernels should be plump shiny and filled with milk. Fresh corn can be preserved as whole kernels or cream style. To can whole kernel corn, husk corn, remove silk and wash. For canning corn, cut corn about 2/3 depth of the kernel from the cob; do not scrape the cob. Pack the corn loosely (do not press down) in clean hot jars leaving 1 inch head space. Add 1 teaspoon salt to each quart jar and cover with boiling hot water leaving 1 inch head space. Adjust lids and process in pressure cooker 1 hour and 25 minutes at 10 pounds of pressure. When canning corn you may want to can a cream style corn recipe. As with whole kernel corn husk the corn, remove silk and wash. When preparing the corn cut the tips off the kernels. Using the back of a knife run it down over the kernels to scrape out the pulp from the kernels and mix with the cut tips. Measure the corn and add 1 teaspoon salt and 2 ½ cups boiling water to each quart of corn; precook for 5 minutes. Pour boiling hot mixture into hot pint jars; adjust lids and process pints in pressure canner for 1 hour and 25 minutes at ten pounds of pressure. NOTE: For crisper and brighter corn add 1/2 teaspoon citric acid to each quart jar. Trim the ears of corn so they fit into quart jars. Drop the ears of corn in boiling salted water; boil for 4 minutes. Drain the corn on clean towels and let them dry out for 2 hours; turn them over after 1 hour. Fit the ears of corn into clean quart jars. Combine the 1 quart water, salt, sugar, bay leaves, peppercorns and lemon peel in a large saucepan; boil for two minutes. Stir the lemon juice into the mixture and then strain and then cool. Pour liquid over the ears of corn in jars leaving space at the top; place lids tightly on jars. Process in pressure cooker under 10 pounds of pressure for 85 minutes. Drain corn and save liquid; measure liquid and add enough water to liquid to make 1 cup. Melt butter; blend in salt, pepper and flour. Stir in liquid and cook on medium heat until thickened; stir mixture into slightly beaten eggs. Add corn to mixture and pour into a well grease baking dish; bake about 30 minutes. This corn cakes recipe is a good one if you are canning corn the cream style method. Combine all ingredients and mill well. Drop by heaping tablespoons into a lightly oiled skillet. Fry until crusty and golden brown on each side. Serve with maple syrup and bacon or sausage for a great meal anytime of the day. Cook corn on the cob and remove from heat and cool. Place corn in a stone crock and pour cold water over the corn. Place a plate over the corn and weight it down so the corn is kept under liquid. Place crock in a very warm place; it will pickle in about 2 weeks. If a scum comes on it, take it off; leave corn in the same water. Corn can be used right out of jar just heat and serve. Instead of canning corn you may choose drying corn. You can use this corn in the same dishes as canned corn. Mix all ingredients in a flat bottom pan; stir constantly over heat for 20 minutes. Spread corn on pans covered with brown paper; place in low oven (about 225F degrees) to dry. Stir corn occasionally; NOTE: be very careful when it gets almost dry it can burn quickly. When dried put in a clean thin cloth bag	and hang in the hot sum or near the stove for a week. Then store in a glass jar and seal with a lid. When ready to use in corn recipes, soak before using until soft kernels. Use in recipes as you would canned corn. You may wonder what this question has to do with canning corn or food period. Lye is described as being as a corrosive alkaline substance which you can purchase commercially. Sounds like a chemical far removed from foods. I remember many years ago an older neighbor of mine gave me homemade lye soap to treat poison ivy on my face; it worked great but still not related to food. Many years ago when homes were basically heated with fire wood, the ashes were kept in an ash hopper. Water was poured over these ashes in the hopper. A crock was placed under the hopper to catch the water as it slowly dripped from the hopper. This was lye water and it had many uses in the early years. One of these uses was to make delicious hominy. This was a way of being able to use the older dry corn or even the corn grown for animals; what we called “hog corn”. Hominy is also called samp and is made in both whole grain and ground. Ground hominy is called hominy grits. Whole hominy is what is usually canned in the grocery stores; sometimes you will find whole hominy in dry form. Hominy is chiefly a vegetable but use to be used as commonly as rice or noodles. In past years it was commonly used as a cereal. Today many people do not even know what hominy is, much less make a practice of preparing it. You can purchase it in the grocery stores already canned which makes great hominy recipes. To make your own homemade hominy follow the instructions below. For each 1 gallons of water (Use distilled water) in a crock add 2 tablespoons lye. Shell hard dry corn and put in the water and let set until the kernels swell and break the skins of the kernels. Drain the hominy grains and wash several times thoroughly; drain well. Fry hominy in hot bacon grease and season with salt and pepper. Chop cucumbers, tomatoes, onions, peppers and celery; mix with salt and let stand 30 minutes. Drain off any liquid; add vinegar, sugar, celery seed, mustard seed, flour and turmeric. Boil for 1 hour; pack and seal immediately in hot sterilized jars. This is one of the favorite canning corn recipes because it can be used as a side dish and also in Mexican salads. Boil corn 5 minutes; combine with remaining ingredients. Bring to a boil and simmer 20 minutes. Return to boiling and pack boiling mixture in hot sterilized jars with 1/4 inch head space. Adjust caps and lids and process in boiling water bath 15 minutes.